The Fifth China-France Team Cooperation Innovation Award of the French-Chinese Committee was announced in Paris on December 4. 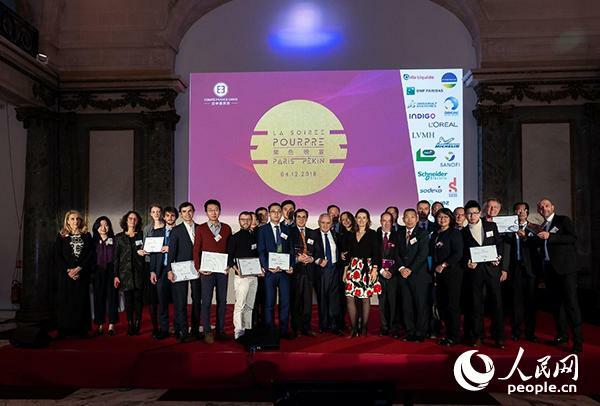 This year, the new awards selected three Chinese and French multinational teams to reward their innovative solutions in environmental protection, transportation, health, industrial applications and smart cities.The Sino-French Teamwork Innovation Awards are divided into three awards, such as the R&D Award, the Innovation Product Award and the Innovation First Award. Among the R&D awards, two Chinese and French teams tied for the first place which are the smart charging system (VALEO/XCHARGE) and Suez Water's sludge dehydration solution (Dehydris Ultra). The smart charging system VALEO/XCHARGE is a new energy vehicle and hybrid vehicle charging and de-charging system controlled by the APP client, developed by French accessory supplier Valeo and Chinese startups. The intelligent charging system relies on the intelligent power supply technology that can ensure the balanced redistribution of the power grid. It can make the car battery store power when the power is sufficient, and recharge when the power is insufficient. The user can also charge or discharge the battery through the smart phone. Suez Water's sludge super-sensing dewatering solution is a clean and rapid solution that can complete ultra-dry dewatering of sludge in a few hours. By running at low temperature, the sludge body can be reduced to 1/4 of the original and converted into Valuable bio-carbon. Suez cooperates with the municipal drainage management department to jointly develop the ultra-dry dewatering process based on hydrothermal carbonization. The long-term operation of this industrialized plant proves that this solution is an environmentally friendly sludge treatment process that is safe, hygienic, energy-saving and emission-reducing, and significantly reduced sludge. It has broad application prospects in the field of sludge treatment. In terms of the Innovative Product Awards, this year's jury selected a Chinese custom drug sensitive card (BIOMERIEUX) that has a special contribution to public health. It is an antibiotic susceptibility card tailored for Chinese patients and Chinese doctors. China is the world's largest antibiotic use. In order to reduce hospital expenditures, save patients' lives, and control global drug resistance, the Mérieux France/USA team led the research and development and was customized by China team to meet the clinical and epidemiological needs of China and to meet the medication habits of the Chinese pharmaceutical industry. This year's Innovation First Award was awarded to the SYSTEMATIC-GOLD TRUFFLE ENGINEERING project. It is an intelligent management platform that leverages the Internet of Things, cloud technology and artificial intelligence to monitor and control the production and storage of new energy sources in real time, and to manage environmental sensors and WiMesh networks. The Innovation Initiative Award F2 project is organized by the French Science and Technology Overseas Center in China which aims to gather a new generation of young talents in science and technology and explore the future development trend of Sino-French science and technology innovation and the direction of cooperation (in Paris and Beijing) to promote innovation and bilateral Cooperation. In 2018, 40 (20 Chinese and 20 French) elites under the age of 40 were selected for exchanges and discussions. The final results of the F2 awards will be announced in 2019.This year's F2 Initiative Awards focus on the field of artificial intelligence. The winning candidate teams include Hongliang Bai (co-founder and CEO of Beijing FaceAll), Amélie Cordier (founder and CEO of Aitian Education Technology, HOMMANO research manager and artificial intelligence research and development experts), Thierry Donneau-Golencer (product manager of SALESFORCE), Shi Miaojing (researcher of Rennes), Wu Zhuohao (vice president of innovation workshop artificial intelligence engineering), Nicolas Meric (chief of DREAMQUARK Executive Officer), Grégory Renard (XBRAIN vision and research team leader). The finalist's artificial intelligence project involves education in speech recognition and adaptive language learning techniques, customer relationship management, image processing and understanding, insurance and medical data.